Police in the Democratic Republic of Congo have deployed at the main road to Zambia, after opposition politician Moise Katumbi declared he would attempt to return to his Lubumbashi base using that route. Katumbi, who was expected to return from self-imposed exile in Belgium, is hoping to make it back home in time to submit his application for December’s presidential elections. The deadline is August 8. Katumbi has been living in Belgium since May 2016 after falling out with President Joseph Kabila. He had planned to fly by private jet from Johannesburg to Lubumbashi, the capital of Katanga province, but the city’s mayor said Thursday that Katumbi would be refused entry. Katumbi’s spokesman Olivier Kamitatu said “authorisation to fly over and land had been refused by Kinshasa”. “We will take off in the direction of (Zambian city) Ndola to take the road to Lubumbashi,” Kamitatu tweeted. Katumbi told AFP later that he had arrived in Ndola at around 0900 GMT and was heading to the border post of Kasumbalesa. The drive to the frontier takes more than six hours, according to local sources. 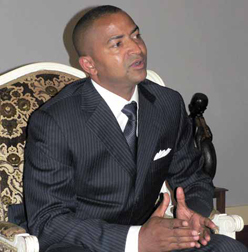 Katumbi, 53, already faced potential arrest after being handed a three-year jail term in absentia in June 2016 in a case of alleged property fraud. He has also been accused of hiring mercenaries and for possessing an Italian passport, Congolese law does not allow dual nationality. He denies the charges in both of those cases. The Democratic Republic of Congo has never known a peaceful transition of power since it gained independence in 1960 — and some experts fear that the December 23 elections may trigger a bloody conflict. Kabila has refused to spell out whether he will seek a new term in the vote. Candidates must submit their applications by August 8 and physically be in the country to do so. Kabila trails opponents in latest opinion poll ahead of December elections.